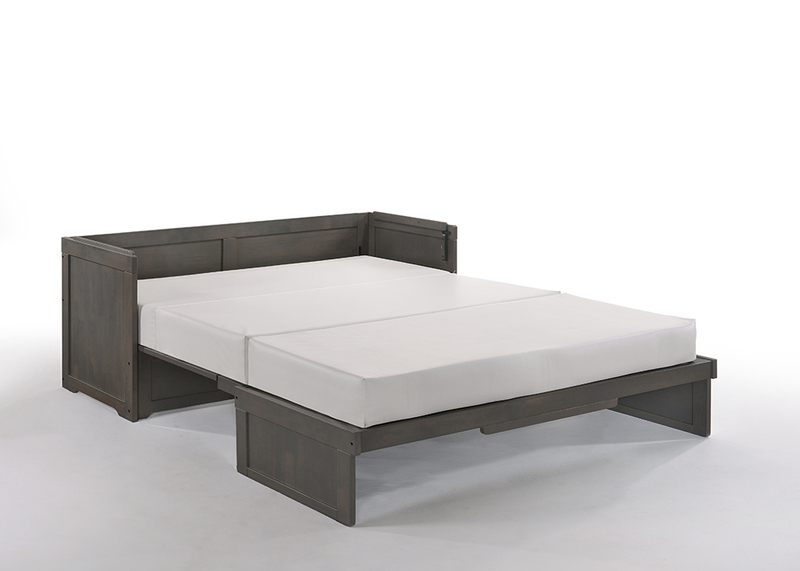 Our Murphy Cube Cabinet Bed is a truly instant guest bed. Convert it from handsome cabinet to comfy queen bed in less than a minute. When all closed up it just takes 10 square feet of floor space. Shown above in Cherry finish, also available in Dark Chocolate, Stonewash and White finishes. The Murphy Cube bed can be shipped via UPS Ground or LTL Freight*. Most orders ship out within two business days. The Murphy Cube Cabinet Bed comes width a limited 10 year warranty. The supplied mattress is covered by a limited 3 year warranty. The warranty applies only to the original purchaser and does not cover: (a) wear and tear; (b) damage caused by abuse or failure to follow care instructions. Items must be returned in original packaging. Money back on returns notified within 7 days of delivery receipt. Buyer pays all shipping costs. Return authorization required. Subject to 20% restocking fee.